Dr. Joan Bouza Koster is an award-winning author of writings in the fields of ethnography, education, anti-racism, history, and the arts. Her poetry has been published in The Potomac. In addition to numerous scholarly and popular magazine articles, she has written three books: Growing Artists: Teaching the Arts to Young Children, Bringing the Arts into the Elementary Classroom, and Handloom Construction for the Non-Expert. She also illustrated the Anthropologist’s Cookbook and the Peace Corps publication Fish Pond Management. She has just finished her second historical novel which focuses on abolition and the women’s movement during the Civil War era. This novel long-listed for the Mslexia award. Her next project is a novel about a mystic marriage counselor pursued by obscenity-busting special agent Anthony Comstock. Just read through some of your posts, interesting stuff! Thank you. I never thought when I started this blog that I would find so many wonderful women writers. Thank you for the compliment. What do you want feedback on? I’m glad you’re writing about Anthony Comstock — a bit of our history that could use some extra attention. Thanks for your great support. Something to live up to. Hello Joan! Thank you for stopping by my blog! I love your sight…just reading through couple of posts is inspirational and emancipating! This is a wonderful blog. Please keep sharing the wisdom! Look forward into delving into more of your posts ! Thank you for the compliment. Discovering all these women writers has been a real treasure hunt. I am glad you are finding the writings of these amazing women of interest. I am just overwhelmed by the things women have said and done that I never learned about in school. Thank you for liking the post on my blog. I am going to explore your Civil War blog, it looks really fascinating. Joan — Thank you for visiting my blog (thesmellofgunsmoke.com). I see that we have lots of similar interests! I’m going to check out your other blogs. So glad we crossed paths. Yes, I am glad we did. Your posts are excellent. I am now following you. Thank you for visiting my blog post on Derek Walcott. I appreciate the support. Thank you for your recent visit to my blog. I hope you return again. In the median, I intend on enjoying yours. I hope you saw my Civil War blog American Civil War Voices too. I am a Civil War fanatic. Then purchase my books. You’ll love them (Hey, I need to be my own agent!!). I pray your Thanksgiving was a blessed time. I’ll see you here and there. Thanks for liking the post about STORM on the George R. Stewart web log. Stay tuned, too — more to come. You’re welcome. I think it very brave to have a poetry blog and shares one’s work with so many others. I love that you’ve opened my mind to so many inspirational women. You are one among them. Inspirational. Spread the love and peace. Thank you. As struggling writer, these voices inspire me. I am glad they inspire you. When I started this blog, my intention was to pull a book off my shelf each week and siphon out a thoughtful paragraph or two. I thought that it was important to share the actual words of women because, so often, all you can find on the web are biographies and brief quotes. But in doing this, I have had to read and reread so many wonderful works by women and fall in love with them all over again. I have also discovered buried here and there women whom I had not encountered before whose voices deserved to be heard. I agree with you there.There are a lot of powerful woman writers but rarely do we get to indulge in their stories. 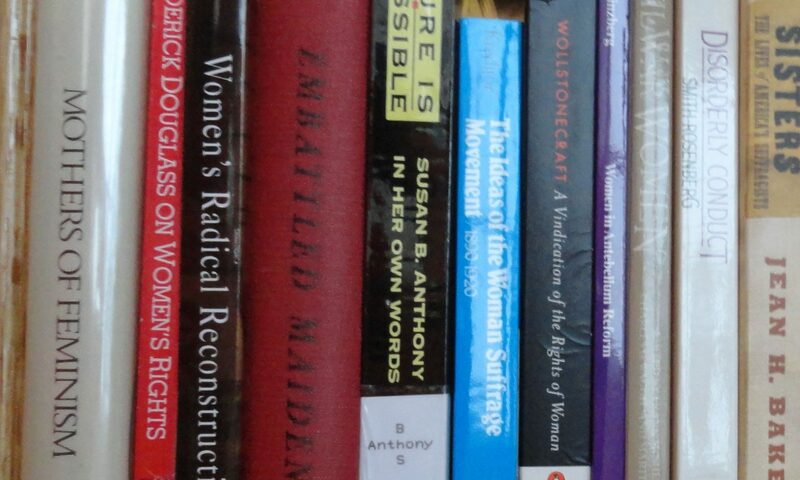 I would love to bookmark more women authors in my tiny library. Would love suggestions from you. Just nominated you for the Inspiring Blog Award. You can find out more here: http://deborahbrasket.wordpress.com/2013/03/17/sweet-satisfaction/. I love what you are doing here. Great to see someone out there plugging ‘the right messages’, mate! Keep up the good work, Joan.